LOUISVILLE, Ky. -- Its survival on the line, Kentucky's last abortion clinic is bracing for a pivotal legal showdown with health regulators and the state's anti-abortion governor that could determine whether Kentucky becomes the first state in the nation without an abortion clinic. 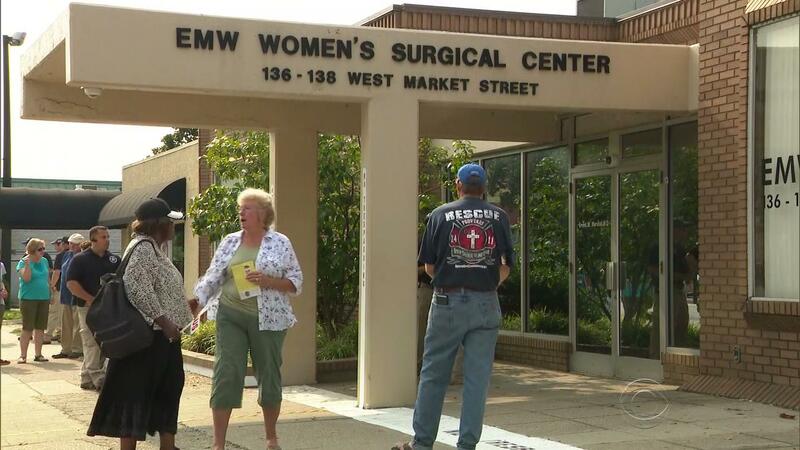 The licensing fight, set to play out in a Louisville federal courtroom starting Wednesday, revolves around a state law requiring that EMW Women's Surgical Center have agreements with a hospital and an ambulance service in the event of medical emergencies involving patients. State regulators defend those conditions as "important safeguards" to protect women's health. The clinic in downtown Louisville counters that the requirements lack any "medical justification" and amount to an unconstitutional barrier to abortion. But the case's significance goes beyond a debate about state law. "The stakes in this case couldn't be higher: the very right to access legal abortion in the state of Kentucky is on the line," said Dr. Ernest Marshall, who opened the clinic in the early 1980s. The licensing fight began in March when Republican Gov. Matt Bevin's administration claimed the clinic lacked proper transfer agreements and took steps to shut it down. The clinic countered with a federal lawsuit to prevent the state from revoking its license. U.S. District Judge Greg Stivers blocked the clinic's closure until the dispute could be heard at trial. In its lawsuit, the clinic says it has had agreements with a hospital and an ambulance company on file with state regulators for years. The state's abrupt "about-face" -- finding the clinic non-compliant -- came "out of the blue," the lawsuit said. Arguing that there's no medical justification for the standards, the clinic is seeking a ruling that those requirements infringe on constitutional protections. Clinic attorney Donald L. Cox said the requirements have one purpose: "to give the state an excuse to prohibit abortions." Complications from abortions are rare, the lawsuit said, but if they occur "ambulance companies will readily pick up patients, and hospitals are required by law to accept patients in an emergency." The state's legal team, in its court filings, conceded that EMW could dial 911 in an emergency, but added: "that does not provide the protection for women deemed necessary by the Kentucky General Assembly and does not satisfy the law of Kentucky." The state's lawyers took aim at claims the requirements aren't medically essential. "The plaintiff's self-serving statements about the rarity of complications from abortion gloss over the fact that such complications do occur and that transport agreements are important safeguards for women's health in the event of such complications," they said. The EMW clinic has been on the defensive since Bevin's election in 2015. The socially conservative governor calls himself an "unapologetically pro-life individual." "The transfer agreements' requirements in question -- which were enacted in 1998 and not questioned for 19 years -- are important measures for ensuring women have the proper life-saving procedures in place in the event of an emergency," said Bevin's spokeswoman, Amanda Stamper. "Essentially all health-care facilities in Kentucky are required to have such agreements, and it is telling that the abortion industry believes that it alone should be exempt," she added. In another twist, Bevin's administration added new requirements to transfer agreements amid the legal wrangling. Critics said the changes were meant to make it harder to get a state license for abortions. The lawsuit is one of two pitting the clinic against the state. The other lawsuit is challenging a new Kentucky law requiring doctors to conduct an ultrasound exam before an abortion, then try to show fetal images to the pregnant woman. The law says she can avert her eyes. EMW gained an ally in its licensing fight when Planned Parenthood of Indiana and Kentucky was allowed to join EMW's lawsuit. Planned Parenthood argues that Bevin's administration has used the transfer agreements to block its requests for a license to provide abortions in Louisville. EMW's legal team believes the case "falls squarely" within a 2016 U.S. Supreme Court ruling that struck down Texas regulations that required doctors who perform abortions to have admitting privileges at nearby hospitals and forced clinics to meet certain standards for outpatient surgery. The Supreme Court has found that access to an abortion must be guaranteed, but it remains to be seen whether eliminating every clinic in a single state would pass that test. "Will we build on the momentum of last year's Supreme Court decision upholding abortion rights?" Marshall said. "Or will Kentucky be the harbinger of a future where the right to abortion only exists if you live in the right zip code?"